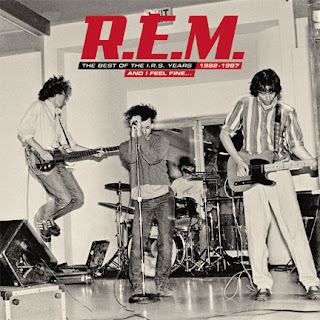 Fourth Grade Nothing: Goodbye R.E.M. R.E.M. got me through high school in the late '80s. I have Michael Stipe to thank for getting me through high school in the 1980s. High school - the most difficult four years of my entire life. I have seen R.E.M. live about four times and always thought they were one of the best live bands ever. My husband and I caught them in the summer of 2008 at my most favorite Long Island venue -- Jones Beach. An outdoor concert on the beach is always a gamble and we almost lost. That evening, we were faced with the most relentless thunderstorm of the century. I mean this storm was so bad the theater was actually struck by lightning. Folks were too scared to venture back to their cars to leave the beach theater. It was a true, "Hell no, we won't go" situation and within a few hours I was shocked when R.E.M. hit the stage. Soaked to the bone, I danced and sang along to each and every hit as if I were 15 again. Walking to the car I remembered the time I phoned in "Superman" to our local modern rock station, WLIR. The DJ refused to play the song unless I sang it. Embarrassed, but up for the challenge, I sang a few lines of the song and the DJ granted my request. I was hoping to see the band perform one last time -- maybe some day. R.E.M. thank you for being such an integral part of my youth. I'm sure you've touched thousands. You will be missed. Wow, can you believe they broke up after all this time! Great memories! I remember when "Losing My Religion" came out and I thought it was fantastic. Still do. The fact that I could actually understand the words, was amazing, since so much of the music out there left me going, "Huh?" I'm a fan of some of R.E.M. 's songs, but not necessarily the band itself. I used to love watching the video to "Shiny Happy People" on VH-1 (I also had the cassette single), and "It's the End of the World As We Know It" is totally classic. I also love "Stand."